در این پژوهش به بررسی تأثیر صنایع نفتی محدوده دشت شازند بر تغییرات مکانی کیفی منابع آب زیرزمینی با استفاده از تکنیک زمین آمار و سیستم اطلاعات جغرافیایی پرداخته شد. هدف این پژوهش شناسایی محدوده تأثیرپذیر و عوامل مؤثر در آلودگی است تا پهنه مناسب تأمین آب شرب و کشاورزی را از نظر کیفی در محدوده مطالعاتی شناسایی نمود. بدین منظور با نمونه‌برداری از آب چاه‌‌های محدوده مطالعاتی، آنالیزهای آزمایشگاهی مواد نفتی و آروماتیک انجام شد. سپس با تکنیک زمین آمار و به روش معکوس فاصله وزنی، روند تغییرات مکانی غلظت پارامترهای کیفی بررسی شد. برای این کار، منظور از تحلیل‌گر زمین آمار در نرم افزار ArcGIS 10.3 بهره گرفته شد.همچنین مقایسه مقادیر با حد مطلوب و حد مجاز استانداردهای محیط زیست بررسی گردید. نتایج نشان داد از نظر آلودگی‌‌های نفتی به جز در چند مورد استثناء، در بیشتر موارد آلودگی قابل توجهی وجود ندارد. بیشتر حساسیت‌‌ها در این بخش در چاه شماره 10 مربوط به دو پارامتر Anthracene و Pyrene از ترکیبات حلقوی چند هسته‌ای بود که مقادیر آلاینده چندین برابر استاندارد محیط زیست دیده شد. با توجه به توسعه مجتمع‌‌های نفتی شازند در سال‌‌های اخیر و نقطه روشن‌‌های آلودگی، هر چند بصورت محدود، به نظر ‌‌می‌رسد خطر آلایندگی منابع آب زیرزمینی دشت شازند در آینده بیش از پیش افزایش یابد. Strategic and important industries are established in areas with possible access to water. Industrial development requires abundant water. Analysis of environmental resources and their pollution is the first consequence of industrial and human activities. Therefore today, due to the large volume of discharge and pollution in the environment, direct use of water is neither reasonable nor possible. Discharging industrial wastewater in land could severely contaminate the groundwater. In oil pollution monitoring researches, it is noteworthy that pollution detection and renovation operations require time and economic costs. Contamination of Soil and groundwater with pollutants such as hydrocarbons and chemical solvents has various environmental impacts. In Iran, the concentration of pollutants in some groundwater resources has been reported to be up to three times more than the standard value. This indicates the effect of a large amount of waste in the area which decrease soil quality in a way that soil layers are not able to compensate for it. Therefore, wastewater changes the drainage of underground water resources. In Iran and many other countries, causes such as leakage from contaminated petroleum storage tanks, leakage from transferring lines due to worn pipes, transportation of oil products, etc. in oil extraction mines, and refineries results in groundwater and surrounding areas facing oil leakage. The purpose of this research is to produce the water quality map of Shazand plain in Markazi province using Geographic Information System (GIS) technique and to investigate the effects of oil industries on the quality of underground waters. The first step is to identify areas affected by these oil industries and identified factors. Appropriate agricultural areas with water supply in the qualitative range were also identified. The location of existing wells in the plain, particularly wells located around the refinery and petrochemical complexes were investigated for the first time. Then, considering the direction of the water land in the plain and the paths of wells located at upstream mountains to downstream ordinary rivers, wells located in the refinery and petrochemical complexes were selected. Accordingly, 14 wells were sampled in the first stage and their coordinates were obtained using GPS. The samples were classified in the laboratory into four groups including physical parameters, chemical parameters, oil and water aromatic parameters and water volatile organic compounds parameters. In the next stage, the maps of water quality parameters zoning were prepared using the "Geostatistical Analyst" developer with the use of the interpolation method of "Inverse Distance Weighting (IDW)". Finally, spatial variations and the groundwater quality changes were investigated. Oil and aromatic parameters of water are presented along with the results of laboratory analysis in table 2. Results indicate that the numerical value of many parameters were less than 0.1 mg/L. Just two parameters (Anthracene and Pyrene) in well no.10 had a value of more than 0.1 mg/L. Yet, the total value of oil pollutant was quite different. In wells no. 3, 8, 9, and especially well no.10 the value was more than 0.1 mg/L. The zoning map and spatial variation trend, along with statistical-descriptive indexes of total petroleum hydrocarbon of wells were also produced. The spatial variation of oil pollutants in Dashte- Shazand wells in south-north direction showed an increasing trend, which gradually changed into a decreasing trend. A decreasing trend was also observed in west-east direction. Comparing descriptive-statistical indexes with the standard level, we concluded that the total oil pollutant parameter near well no.10, which is located in petrochemical complex faces contamination. The present study sought to measure some important indexes of oil contamination in groundwater and surface water near Dasht-e Shazand refinery and petrochemical complex. Therefore, data were collected from 14 wells in the study area. Then, oil and aromatic products were analyzed in laboratory. Using geostatistical technique, spatial variations of quality parameters concentration were investigated and compared with the desired and standard level. Results indicate that most of the wells near Dashte- Shazand refinery and petrochemical complex do not show any sign of contamination. Yet, the concentration of Anthracene and Pyrene parameters in well no.10 is several times more than the standard level. This can increase the potential of contamination in Dashte- Shazand ground water resources. In wells no. 3, 8, 9, and especially in well no. 10, total petroleum hydrocarbon (TPH) was more than other wells. According to the TPH and PAH results, the contamination potential of well no.10 was quite large. Due to the development of Shazand refinery, ground water resources of the area face an increasing danger of contamination. Moreover, the area has a high potential of population increase in residential areas. Thus, water contamination can also endanger the local environment. This shows the necessity of an appropriate management plan and regular monitoring of ground water, surface water, soil and air in the area. 1. آب- آب آشامیدنی بسته‌بندی شده - ویژگی‌ها، 1381، مؤسسه استاندارد و تحقیقات صنعتی ایران، نشریه 6694. 2. آب آشامیدنی- ویژگی‌‌های فیزیکی و شیمیایی، 1388، مؤسسه استاندارد و تحقیقات صنعتی ایران، نشریه 1053. 3. پرداختی، ع.اسماعیلی ساری ، ع واسلامی،ا، بررسی کمی و کیفی «هیدروکربن های آروماتیک چند حلقه ای» در هوای تهران در تابستان 1381 ، مجله محیط شناسی، شماره 33 . بهار 1383 ، 16-20. 4. جلالی، ق.، طهرانی، م.م.، برومند، ن. ن. و سنجری، ص. (1392). مقایسه روش‌‌‌‌‌های زمین آمار در تهیه نقشه پراکنش مکانی برخی عناصر غذایی در شرق استان مازندران. مجله پژوهش‌‌‌‌‌های خاک (علوم خاک و آب). 27(2): 204-195. 5. حسنی پاک، علی اصغر، (1389). زمین آمار (ژئواستاتیستیک). انتشارات دانشگاه تهران. 314 ص. 6. خزاعی، س.ح.، عباسی تبار، ح. و تقی زاده مهرجردی، ر. (1390). پهنه‌بندی آلودگی نیترات در آب‌های زیرزمینی استان فارس با استفاده از روش زمین آمار (مطالعه موردی: منطقه سیاخ دارنگون)، نشریه محیط زیست طبیعی (مجله منابع طبیعی ایران)، 64(3): 267-279. 7. زاهدی‌فر.، م. موسوی، س.ع.ا. و رجبی، م. (1392). پهنه‌بندی ویژگی‌‌‌‌‌های شیمیایی کیفیت آب‌‌‌‌‌های زیرزمینی دشت فسا با استفاده از روش‌‌‌‌‌های زمین آماری. نشریه آب و خاک (علوم و صنایع کشاورزی)، 27(4): 822-812. 8. سرمدیان، ف.؛ تقی‌زاده مهرجردی، ر. (1388). مقایسه روش‌های درونیابی جهت نقشه‌های خصوصیات کیفی خاک مطالعه موردی (مزرعه دانشکده کشاورزی). تحقیقات آب و خاک ایران. 40(2): 157-165. 9. سمرقندی، م.ر.، ویسی، ک.، ابویی مهریزی، ا.، کاسب، پ. و دانایی، ع. (1392). بررسی کیفیت آب دریاچه سد مخزنی اکباتان شهرستان همدان با بهره‌گیری از شاخص کیفی NSFWQI. مجله دانشگاه علوم پزشکی خراسان شمالی، 5(1): 69-63. 10- شعبانی، م. (1387). تعیین مناسب‌ترین روش زمین آمار در تهیه نقشه تغییرات pH و TDS آب‌‌‌‌‌های زیرزمینی (مطالعه موردی: دشت ارسنجان). مهندسی منابع آب، 1(1): 47-57 . 11. فیضی، و. و شجاع جمال آباد، م. 1389. اندازه گیری بقایای آلودگی های نفتی «هیدروکربن‌های آروماتیک چند حلقه ای» درآب های 3 تالاب بین المللی (آلاگل، آلماگل و آجی گل) در شمال ایران، فصلنامه علمی محیط زیست، 49:57-63. 12. کاشی زنوز، ل.، نامدار، م. و سعادت، ح. (1390). بررسی عوامل مؤثر در شوری خاک، با استفاده از مدل آماری رگرسیون چند متغیره خطی (مطالعه موردی: حوضه آبخیز هرزند چای). پنجمین کنفرانس سراسری آبخیزداری و مدیریت منابع آب و خاک کشور، 9ص. 13. کمالی، م. ا.، عصاری، م. و محمدی، ک. (1387). 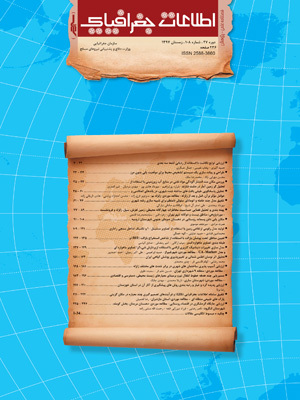 آنالیز مکانی کیفیت و آلودگی آب‌های زیرزمینی با استفاده از زمین آمار و GIS. دومین همایش تخصصی مهندسی محیط زیست، 10 ص. 14. محمدی، ک.، رازدار، ب. و محمدولی سامانی، ج. (1387). بررسی کیفیت آب رودخانه پسیخان با استفاده از مدل CE-QUAl-W2 WASP در مورد پارامترهای نیترات و فسفات و مقایسه نتایج حاصل از شبیه سازی با نرم افزار WASP. چهارمین کنگره ملی مهندسی عمران، دانشگاه تهران، 8 ص. 15. معاونت برنامه‌ریزی و نظارت راهبردی رییس جمهور. ضوابط زیست محیطی استفاده مجدد از آب‌های برگشتی و پس‌آب‌ها. 1389، وزارت نیرو، 155 ص. 16. ملایی، ع. (1391). بررسی روند تغییرات کیفیت آب زیرزمینی در منطقه دشت آب کرمان با استفاده از روش‌‌‌‌‌های زمین آماری (چکیده). مؤسسه تحقیقات فنی و مهندسی کشاورزی، شماره ثبت: 42634. 17. نصیراحمدی، ک.، یوسفی، ذ. و ترسلی، ا. (1391). پهنه‌بندی کیفیت آب رودخانه هراز بر اساس شاخص .NSFWQI مجله دانشگاه علوم پزشکی مازندران، 22: 71-64. 18. Anyakora C, Ogbeche A, Palmer P, Coker H. Determination of polynuclear aromatic hydrocarbons in marine samples of Siokolo Fishing Settlement. J chromatogr A 2005; 1073: 323-330. 19. Elci A., Gunduz O., Simsek C. and Celalttin S. (2012). Spatial and temporal assessment of groundwater quality indicators and hydrogeological characterization of a karstic aquifer in western turkey. Araliable from:http://kisi.deu.edu.ir: 12p. 20. Fetouani, S., Sbaa, M., Vanclooster, M. and Bendra, B. (2008). Assessing groundwater quality in the irrigated plain of Triffa (north-east Morocco). Journal of Agricultural Water Management, 95: 133-142. 21- Maskaoui K, Hu Z. Contamination and ecotoxicology risks of polycyclic aromatic hydrocarbons in Shantou coastal waters, china. Bulletin of environmental contamination and toxicology 2009; 82: 172-178. 22. Ng, S.M.Y., Wai1, O.W.H., Xu1, Z.H., Li1, Y.S., and Jiang, Y.W. (2005). Application of GIS for Retrieval and Display of Hydrodynamic and Water Quality Data for the Pearl River Estuary. Environmental Informatics Archives, 3: 372–378. 23. Uyan, M. and Cay, T. (2010). Geostatistical methods for mapping groundwater nitrate concentrations. 3rd International conference on cartography and GIS: 12-20. 24. Vathananukij, H. (1994). Water Quality Analysis on the chao-phra-ya Estuary using remote Sensing Data. Kasetsart University RIO Thailand.